This weekend we had a fun baby shower for one of my sister’s-in-law. 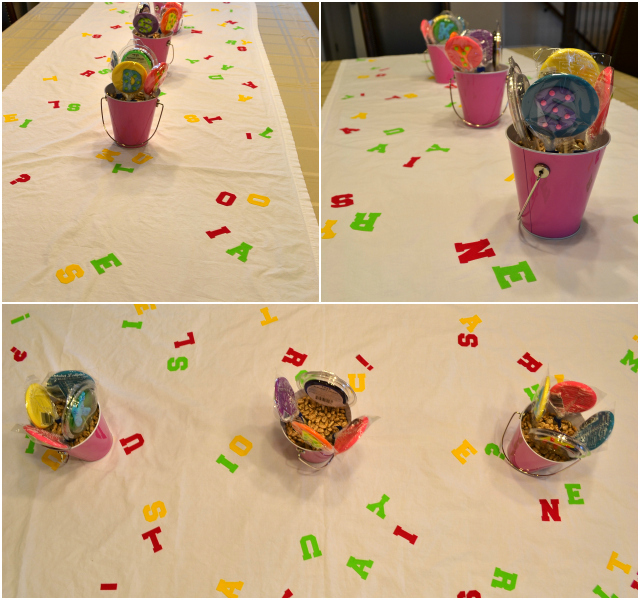 When we were throwing around theme ideas, I remembered that I some iron-on letters from MyNextStyle.com to review that would be perfect for an alphabet baby shower. The decorations were so easy, so cute, and now they can be used in the baby’s nursery!I had the colors lime, fuchsia, and yellow. I cut out a complete alphabet of each color and split them up into three groups: one for a bunting, and two for pillows. I realized that a white bandana or a fat quarter would make a perfect long alphabet pillow. I was worried that the letters wouldn’t iron onto felt, but they did without any trouble! The alphabet bunting also sewed up easily after ironing. With the random, leftover letters I ironed them onto half of a white sheet for a alphabet confetti table runner. My mom found some letter suckers on sale at a candy factory outlet nearby for the perfect touch. We had suckers, pencils, and notebooks as favors. For an activity there were two onesies to draw names and the alphabet on. 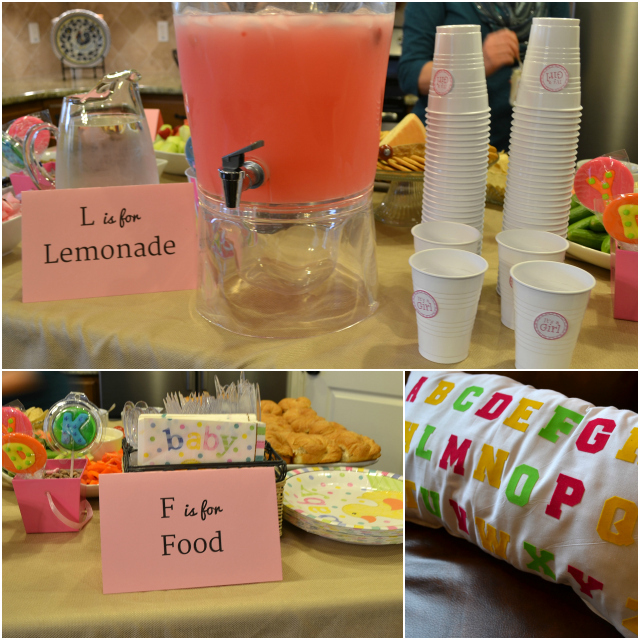 I found a cute idea on pinterest to label areas like “L is for Lemonade” and “F is for Food.” We just typed it up and printed it out. Nothing hard here! The shower turned out great, and the friendships and kindness shown was the best part. For my gift I just refashioned a couple items. 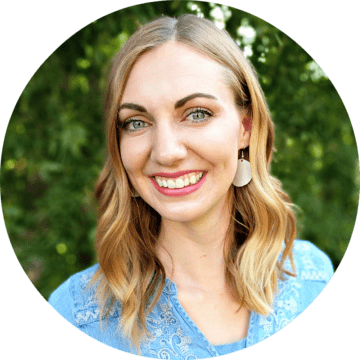 I changed a tank top into a shirt/tunic. I kind of made it up, so I have no idea what size it is. Then I took a cardigan and made it into a 18 mos size. 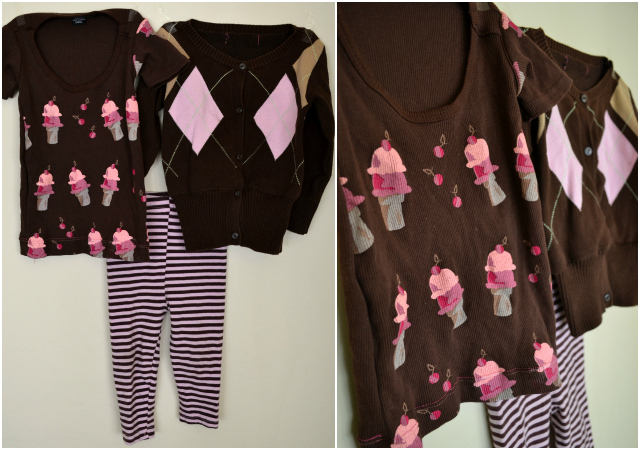 I had some pink and brown striped pants that I didn’t make that went with the collection perfectly. For fun I made some little little owl tights using Rae’s free baby tights pattern and some bloomers using my Perfect Playtime Pants Pattern in size 18 mos. I love how the maroon ribbing sets off the flowers in the print. I tried to make all larger sizes because you don’t often get those at showers, but I just love little tights! LOVE this whole idea Heather. Awesome! So cute! What a great idea. I did have a chuckle that you got the Ks backwards. Haha. I have totally had those moments…too often.